Heat oven to 450°F. Spray bottom of 13x9-inch pan with cooking spray. Cut tilapia into 4 serving pieces. Place cereal in resealable food-storage plastic bag; seal bag and finely crush with rolling pin or meat mallet (or finely crush in food processor). In shallow bowl, mix cereal, basil, salt and pepper. In another shallow bowl, place milk. Dip fish pieces into milk, then coat with cereal mixture; place in pan. Drizzle oil evenly over fish. Bake uncovered 10 to 15 minutes or until fish flakes easily with fork. Meanwhile, in small bowl, mix all sauce ingredients until blended. Serve sauce with fish. If desired, garnish with fresh basil leaves. 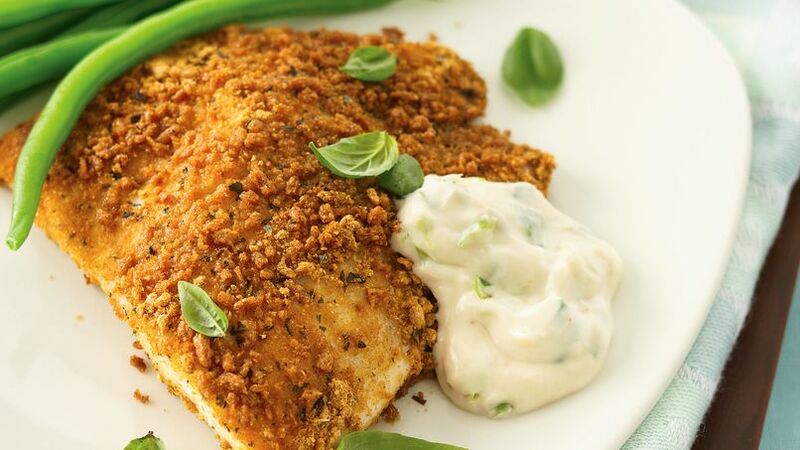 Fiber One® cereal coating adds a crunch to this simple and flavorful baked fish dish – dinner ready in 30 minutes.